Three more dates are confirmed for the end of the year. 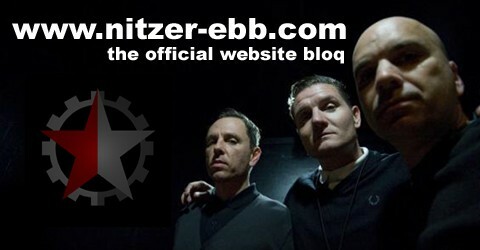 Nitzer Ebb are confirmed to headline the Neuwerk festivals dates in Langen, Krefeld and Hamburg in late December 2011. Pre sales have already started. The new EP contains the NEP Tracks On The Road and Blood Money as well as To The Hilt and High Tech Low Life by Die Krupps. The tracks are each re-arranged by the other band and the limited CD will be sold during the Join In The Rhythm of Machines tour only. Check nitzer ebb website for all information about the new release! Today the Join In The Rhythm Of Machines Tour will be starting in Paris. Until end of april they will play 11 exclusive shows in 6 european countries. Besides an EP, which will only be available at the shows, the fan can expect more surprises on the night of the event. Listen to Xian Engel’s fan interview with Nitzer Ebb. It was made exclusively for nitzer-ebb dot com. The talk took place backstage at the New York Gramercy Theater in November last year during the Ebb’s north american ICP Tour. It is the first part of the NYC Interview session. The second part will be online soon and contains the interview with NE Drummer Jason Payne. Thanks to Stefan and Xian of nitzer-ebb.com Crew North America! Check Mulitmedia Site on Nitzer Ebb Website to listen the interview!